I was asked for this post to write about hope in fantasy. And that means I need to talk about grimdark. I was asked for this post to write about hope in fantasy. And that means I need to talk about grimdark. (Definition from TV Tropes here, for those who need it.) And I need to say, before I start, that I am a practitioner of grimdark; the Doctrine of Labyrinths quartet (Melusine (2005), The Virtu (2006), The Mirador (2007), Corambis (2009)) can be nothing but. So I’m not speaking as someone who abhors grimdark, but as someone who loves it. I’m not stumping for Pollyanna-ism. I don’t want to reverse the polarity and insist that sweetness and light is superior to gritty dystopianism. (I like grimdark, remember.) But dystopias that entirely deny the existence of virtues like compassion and altruism (1984, A Clockwork Orange, The Lord of the Flies) may be great literature, and great cautionary tales, but the more we accept and promote them as “more realistic” and “better,” the more we make it likely that they become more accurate mirrors of our species. If nobody models compassion, how is anyone supposed to learn to practice it? I can feel the word escapism! loitering around the edges of this post and trying to shove its way in, because that is of course the way that followers of “serious,” “realistic” fiction denigrate any suggestion that not everything has to be one dreary disaster after another. Also, of course, escapism! is something that gets yelled at fantasy a lot (like albatross! in the Monty Python sketch) to beat it down and persuade us all that fantasy isn’t important and doesn’t matter, that it’s trivial and childish and unworthy of our attention. J. R. R. Tolkien and Ursula K. Le Guin, two of the greatest fantasists of the twentieth century, had (have) strong opinions on the subject of escapism, which I’m just going to quote–Tolkien at great length, because he’s STILL NOT WRONG. Tolkien and Le Guin are arguing that escape means hope, and hope is one of the great virtues of fantasy. My point, aside from remarking that both Tolkien and Le Guin are arguing that escape means hope, and hope is one of the great virtues of fantasy, is what Tolkien says at the end of the passage: they are confusing, not always by sincere error, the Escape of the Prisoner with the Flight of the Deserter. Because I think that’s exactly it. The denigration of “escapism” comes from an implicit belief that it is brave and necessary and heroic to face “reality,” where “reality” is grim and dark and nihilistic (“solitary, poor, nasty, brutish, and short,” as that tremendous pessimist Thomas Hobbes puts it), and that if you turn away from that “reality,” you are a deserter and therefore a coward. There are a number of fallacies here, as Tolkien notes. One is the claim to the exclusive right to define “reality.” Second, if this is an accurate definition of “reality,” it is a fallacy to believe that it is even possible to desert from the front lines by anything short of suicide. Even if your consumption of fiction takes you away from “reality” for an hour or two, you’re always going to have to come back. Clearly, if we accept this definition of “reality,” “escapism” can only be the most tremendous blessing fiction has to offer. But going back to that first fallacy . . . “Reality” is not simple to define (as my persistent use of quotes is meant to indicate), and just because a literary movement or several have chosen to privilege and valorize darkness and gritty brutality doesn’t actually mean that that represents “reality” any more than My Little Pony: Friendship is Magic or The Care Bears (that plague of my own childhood) does. (It’s completely unfair to pick animated TV shows for children as examples, since they’re not even pretending to be real, but–I note for the record–they are trying to model virtues like sharing and loyalty and kindness to their small viewers.) Representing reality in fiction is an oxymoron anyway (even though it’s one that I, like many other writers, strive to resolve as best I can in my work); there’s no need to compound the problem by artificially limiting what counts as “reality” and what doesn’t. Cynicism is fashionable in the current grimdark era, the attitude that we are too smart to be taken in by idealism. And god knows it’s true that human beings are capable of evil–not only of committing atrocities, but of reifying atrocity into a cultural ethos. (I read a lot about Nazi Germany. Believe me, I have no illusions about human nature.) But human beings are also capable of breathtaking self-sacrifice and compassion and grace, and denying that gives as false a view of human nature as denying our capacity for evil. And that, I think, is where hope comes in. If we understand “escapism” as the Escape of the Prisoner rather than the Flight of the Deserter, then surely what motivates it, more than anything else, is hope. The hope that the prison is not eternal. The hope of communicating with other prisoners. The hope that if you keep chipping away at the bars long enough, one of them will fall out. And I refuse utterly to classify that hope as weak or foolish. “No live organism,” Shirley Jackson wrote at the start of The Haunting of Hill House, “can continue for long to exist sanely under conditions of absolute realism; even larks and katydids are supposed, by some, to dream.” Fantasy allows us to dream–both of better worlds and of worlds gone wrong. And we need them both. Katherine Addison is the pseudonym of Sarah Monette. 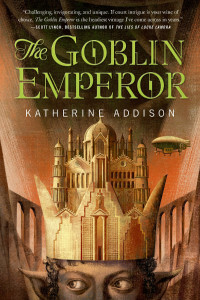 Her latest novel, The Goblin Emperor, published under the pen name Katherine Addison, came out from Tor in April 2014. Really nice piece (though to my mind, works like 1984/LotF don’t deny compassion and altruism, they just highlight its suppression to make a larger – and yes, darker, point). 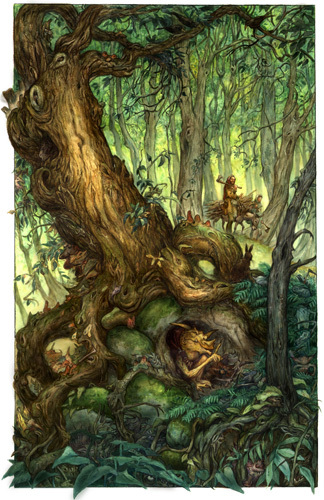 I really enjoyed the Tolkien take on escape (and Le Guin’s), which I hadn’t read before. I also like the idea of overlaying hope onto the idea of escapism: by that definition, even grim speculative fiction is on some level hopeful (maybe by that token, all fiction is hopeful?). It’s also interesting to think about how culture defines (and enforces) ideas like “seriousness” in a way that’s I suspect as much about tribalism (our turf is better than your turf!) as much as any sort of meaningful analysis. While I agree with your main points here, I have to take some issue with what appear to be standards reactions to literatery fiction that seem to be part of our Geekery these days. We need to get past judging other people’s work if we’re tired of being judged ourselves. The emphasis on “dark is better” you mention as being part of the 20th Century literary thinking wasn’t some High Culture snobbery. It was in large part an understandable reaction to WWI and WWII. “Grimdark” literature came out of the shadows with modern warfare and hi-tech genocide. Nuclear weapons were just more evidence of the evil humans were capable of doing to each other and the world around them. The fashion for Existentialism in post-WWII Europe had the same roots. We could call it post-traumatic stress and not be far off. The criticism of imaginative escape often takes the form of a judgment that to escape is to shirk one’s Duty. Just what that Duty is will vary based on who is pronouncing judgment upon us. Perhaps we should be out improving everyone else’s morals, saving souls. Perhaps we should be rushing to the barricades on behalf of the revolution, ending all social injustices. Perhaps we need to give up our irrationality and work on expanding the body of scientific knowledge, the only “real” knowledge. Or maybe we just need to “grow up”, get a job, contribute to the economy, serve our country, raise a family, “be useful”. In each case, the agenda of those requiring us to Do Our Duty is questionable. Even the goals that sound valid and worthwhile to each of us, as individuals, have already been pursued with great passion by earnest and dedicated people to ends that have ranged from deeply discouraging to unspeakably horrific. Clearly, our analysis is incomplete. There is some factor or set of factors not being taken into account by the moralists, the revolutionaries, the scientists, the “common sense” realists. That shouldn’t preclude action, but it should make us question the wisdom of rushing to action as the greatest good, beside which the indulgence of imagination is somehow a failure of courage. An underlying message that the purveyors of Duty browbeat us with, each in their own way, is one we have heard before. And it is not so different from the message of those whose portrayal of life’s pain, violence, grimness, and hopelessness is often praised as being “realism”. That message is the Thatcherite “There is no alternative.” And that is a lie. There are always alternatives, but those who bring us that message would much prefer that we not imagine them. That’s where the writers of grimdark need to be conscious of there own agendas. Is this a message that your work seems to be conveying? Do you believe it? If not, then maybe the possibility of alternatives can be part of your story, without marring its realism. Think about it. I find this sort of article tiring – as usual, there is no attempt to define what “grimdark” is, nor any attempt to use examples. Instead, the term is bandied about as vaguely as possible. It seems that SFF has a chattering class, who like to talk about things, without sharing with us what they are actually talking about.